By Kori ~ July 10th, 2013. Founded in 2000 by Nina Buty and Caleb Foster, Buty Winery has become one of the most highly regarded wineries in Washington State. While Caleb has gone on to other ventures, Nina continues to run the winery. She works closely with winemaker Chris Dowsett and consulting winemaker Zelma Long. Chris gained valuable winemaking experience in Oregon, Australia, and California before moving to Walla Walla in 1996 and joining the Buty team in 2008. In addition to his duties at Buty, Chris also has his own Dowsett Family Winery. 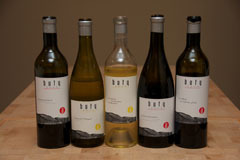 Located in Walla Walla, Washington, Buty remains a small, family winery producing 3,000 cases per year. It focuses on several proprietary blends. Butyâ€™s flagship red wines are two Cabernet Sauvignon/Syrah blends, the Columbia Rediviva (usually Cab-heavy) from the Horse Heaven Hills and the Rediviva of the Stones (usually Syrah-heavy) from the Walla Walla Valley. It also produces a lovely white Bordeaux-style blend called Semillon, Sauvignon & Muscadelle. Through the years, weâ€™ve had the pleasure of tasting a number of Buty wines. Recently, we had the opportunity to taste the 2009 Columbia Rediviva, the 2011 Conner Lee Chardonnay, the 2011 Semillon, Sauvignon & Muscadelle, the 2009 Rediviva of the Stones, and the 2010 Merlot & Cabernet Franc in a blind samples tasting. All five wines are very good, but we especially enjoyed the Columbia Rediviva. This Cab-dominant blend is outstanding and delivers serious bang for your buck. If you are ever in the Walla Walla area, I highly encourage you to visit Buty. 2009 Buty Columbia Rediviva (Phinny Hill Vineyard, Horse Heaven Hills, Washington): 76% Cabernet Sauvignon and 24% Syrah. Dark purple. Beautiful nose with black fruit and floral aromas. More luscious black fruit and floral notes come through on the palate. Medium to full-bodied with lively acidity and medium to high, smooth tannins. Well-balanced with good complexity and a long, lingering finish. 2011 Buty Conner Lee Vineyard Chardonnay (Conner Lee Vineyard, Columbia Valley, Washington): 100% Chardonnay. Pale, greenish straw yellow. Nice nose with apple and pear aromas. More apple and pear as well as a touch of oak come through on the palate. Dry and medium-bodied with lively acidity. Well-balanced with a very long, smooth finish. 2011 Buty Semillon, Sauvignon & Muscadelle (Columbia Valley, Washington): 60% Semillon, 19% Sauvignon Blanc, and 21% Muscadelle. Pale, greenish straw yellow. Aromatic with grass and lemon on the nose. Citrus fruits, grass, and floral notes come through on the palate. Dry and medium-bodied with crisp acidity and a very long finish. 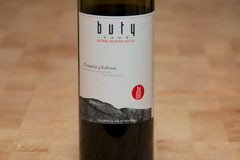 2009 Buty Rediviva of the Stones (Walla Walla Valley, Washington): 77% Syrah and 23% Cabernet Sauvignon. Dark purple. Aromatic with game, earth, and barnyard notes on both the nose and palate. Full-bodied with lively acidity, medium to high, dry tannins, and a very long finish. 2010 Buty Merlot & Cabernet Franc (Columbia Valley, Washington): 58% Merlot and 42% Cabernet Franc. Deep, dark red. Aromatic with oak and spice on the nose. Oak, spice, and red and black fruit come through on the palate. Medium to full-bodied with lively acidity, sweet tannins, and a long finish.